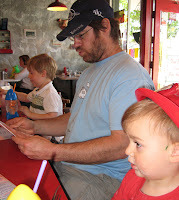 Yesterday I was too busy actually celebrating Father's Day with Mr. Dog to blog about it. So this post may appear to be a day late, but when you have a father like Mr. Dog in the house, every day is Father's Day. The boys and I adore you. You are the kindest, most loving dad in the history of kind and loving dads. I know you feel like you have to be the heavy at times, but remember, you are also the Tickle Monster, the Climber and the one who kisses the boo boos away. You wonder why it is impossible for you to get a bit of peace when you lay down, well I can explain that. Your bond to the boys draws them to you like alley cats to rotting tuna cans, (or if you prefer something less stomach turning, like bees to honey) and they feel the need to jump all over their big strong poppa. Can you blame them? And if you are ever in doubt about your va-voom factor, let me just say this, there is nothing in this world sexier than a big handsome man getting all sweet and goofy with his own children. Nothing. Mark my word. And so, to you my partner in parenthood, I say "Rock On!"